Every time I use Bing Maps for the outer Melbourne region, it never makes sense to me why rivers and creeks have so much precedence on a road map, especially when all the pastel colors blend into a cobweb of lines. Perhaps Microsoft’s Bing team is extremely forward-looking, where car boats are the de facto method of transportation. A Bing story with a Google search link.. oh the irony! I’ve given up on those people already. 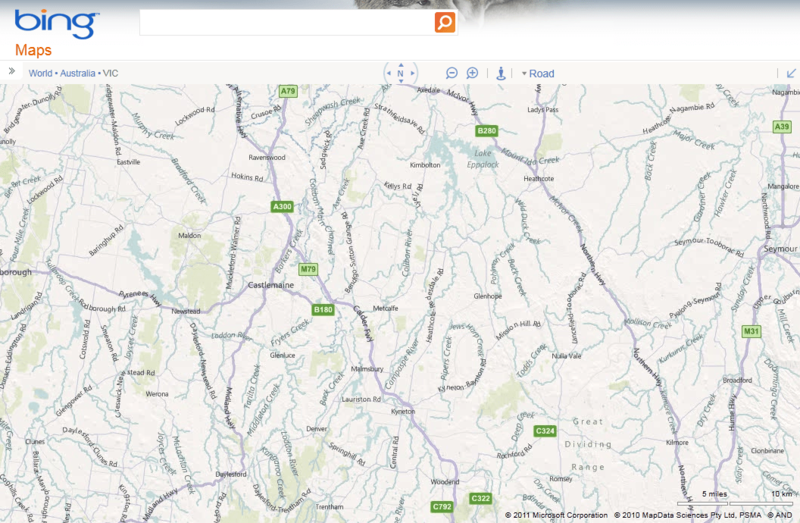 This Bing Maps is 100x more ridiculous than my 1986 UK road atlas! True, things will have changed an awful lot since then, but still, nothing can beat the GOOD OLD RELIABLE paper maps. At least they don’t rely on buggy old Flash and randomly crash when you need them most!